Naomi Heulwen is a British Etsy Shop focussed on the creation of beautiful jewellery and accessories themed around wildlife. Each piece begins with an illustration done by hand. The drawings are then cut by hand and coloured on shrink plastic. They are then covered with a layer of clear resin to keep the lovely design safe from any water damage before being attached to a necklace, brooch etc. My favourite item from Naomi Heulwen is my gorgeous fairy rabbit necklace. The necklace features a lovely wild rabbit surrounded by stag antlers and glittery fairy wings. It's hung on a lovely pale blue/lilac chain which I love as it's sturdy as well as cute. I get so many compliments when I wear this out, it has definitely become one of my most worn necklaces. It's just beautiful and the glitter on the wings really sets the piece off. 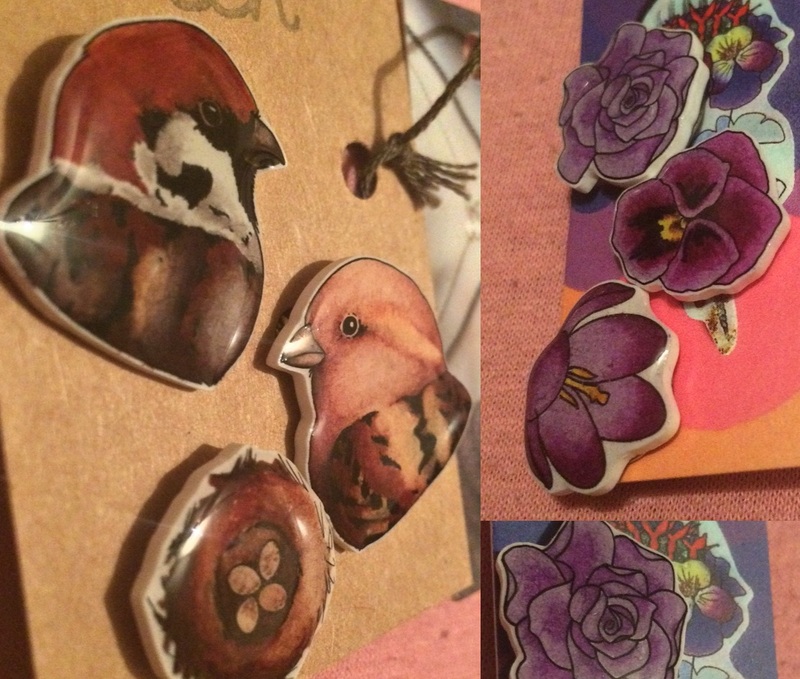 I also love my cute house sparrow brooches. They are currently living on my H! By Henry Holland Bumble Bee Parka Coat which they look very cute on. I love how shiny the resin makes them, they feel very secure and professionally made. It's quite evident that Naomi has worked with resin for a long time as they are flawless. 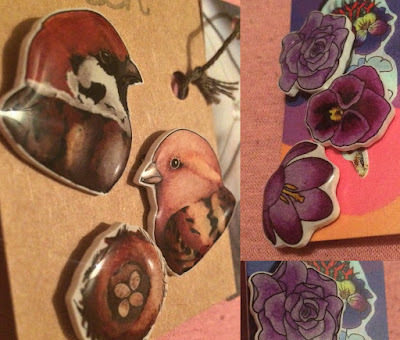 I also love my 3 gorgeous purple flower brooches which are just gorgeous and my precious little bird nest. Naomi's work is amazing - everything is so dainty, beautiful and magical. I 100% recommend that you check out her shop and have a look at everything. She even does commissions so if you'd like her to draw your pet and make it into a piece then definitely give her a message. Her work definitely stands out as exceptional and who wouldn't want a gorgeous statement necklace or a cute brooch?! Find her on Facebook here, and Tumblr here.